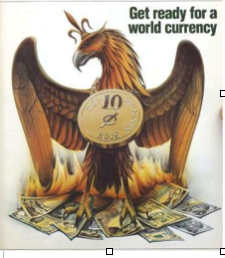 In 1988, the UK magazine, The Economist forecast that 2018 would be the year of a new currency which they named the Phoenix. Quite a mind boggling prediction 30 years ago really, especially since 2018 in fact looks like a year when a major currency upheaval could take place. For conspiracy theorists, the Economist’s owners consist of a number of elite families and bankers including the Rothschilds. Was this a plan which has been in the making for a very long time? 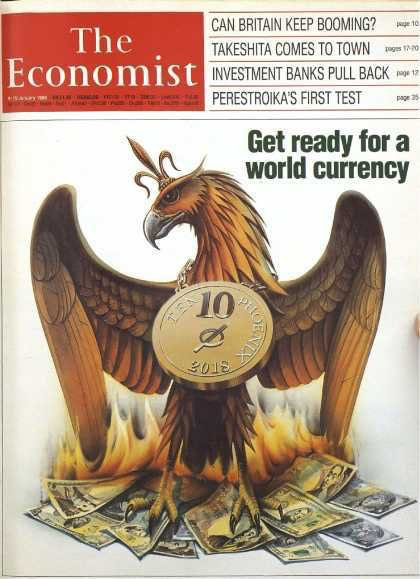 Or is it sheer fluke that a major currency event might take place in the year that the Economist predicted. 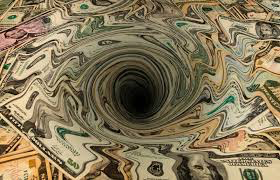 The demise of the dollar as the reserve currency of the world is a certainty. It is only a question of when it will take place. 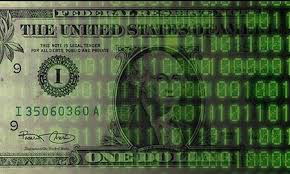 The dollar does not qualify as the rock of the world currency system. Since the gold backing of the dollar ceased in 1971, it has lost 98% in real terms when measured against gold. But also against most other currencies, the dollar has lost greatly. In Swiss francs for example, the dollar is down 77% since 1971. The dollar is backed by massive debts and deficits. The US has not had a real Budget surplus since 1960 and has been running Trade deficits since 1975. The dollar is backed by nothing but debts and a weakening military. It is living on borrowed time. In 1974 the US agreed to support Saudi Arabia financially and militarily on the condition that the Saudis priced oil in dollars. Since most of the world bought oil from Saudi Arabia at that time, it led to a major demand for dollars which is still the case. That was the beginning of the Petrodollar which has enabled the US to live above its means for 44 years. But from 2018 the Petrodollar will gradually be replaced by the Petroyuan and also the Petroruble. China, the world’s largest oil importer, will together with Russia and Iran switch from trading oil in dollars. This will be backed by a futures contract in Petroyuan with a potential convertibility to gold. Except for further military intervention in the Middle East, the US now has little chance of stopping this major strike against the dollar. The US is currently virtually self-sufficient in oil production and is no longer a major trading partner of Saudi Arabia. Therefore, the US neither can nor will stop Saudi Arabia moving its sphere of activity from West to East. The major event this year which has convinced many that we have a new currency system which is controlled by no country and no central bank is of course the Cryptocurrencies led by Bitcoin. In 2017, we have seen a mania in cryptos of massive proportions. At the beginning of the year, the market cap of all cryptos was $17 billion. As of today, there are 1,360 cryptos with a total value of $588 billion. That is a 34 fold or 3,300% increase in the value of cryptocurrencies in just one year. There are 589 cryptos valued over $1 million with Bitcoin being the biggest at $312 billion. How can anyone believe that the world can function with a payment system that has 1,360 currencies which is continuing to grow exponentially with a new ICO (Initial Coin Offering) virtually every day. Cryptos in their present form will never be accepted as currencies. Bitcoin is up 20X in 2017. If that were a currency, it would indicate a 1,900% inflation or more precisely hyperinflation. But Bitcoin is not a currency. Also, it could never be used as a payment system due to the very slow speed of transaction. Bitcoin and other cryptos are just an electronic form of tulip bulbs. 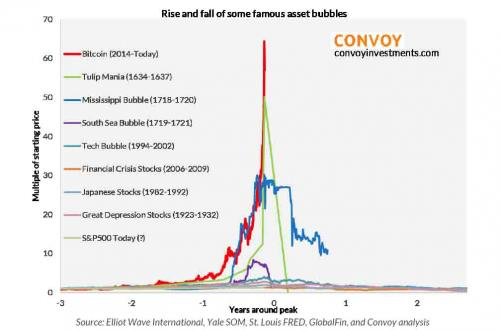 Like tulip bulbs, the Bitcoin bubble can get bigger although the Bitcoin mania is now bigger than Tulipomania as the chart below Indicates. So if there will be a new currency in 2018 as the Economist forecast, it is unlikely to be Bitcoin or any of the 1,360 cryptos. It is of course possible that Bitcoin was constructed by a government in order to experiment how a cryptocurrency would work. Or it could be as Catherine Austin-Fitts believes that governments are closely watching the crypto mania and letting private enterprise develop the market before they step in and ban all cryptos in order to install their own. I would not be surprised to see the US government introducing a Cryptodollar in 2018 or later to replace the current dollar which they know will soon collapse. All existing debt would remain in the Old Dollar. The US government would then encourage and assist a fast appreciation of the Cryptodollar, just like Bitcoin. This would enable repayment of the Old Dollar with the new inflated Crypto$. Obviously, this scheme would not work but for a while a euphoric crypto world might buy it, hook line and sinker. Neither China, nor Russia would fall for this trick. China would lose massively on their US treasury holdings. This would drive these two countries to introduce some form of gold backing of their currencies or payment system. If the paper gold trading exchanges are still standing a that point, China and Russia will use all their resources to break the gold and silver paper market. This would drive up the price of gold and silver into a mania that the world has not seen before. So will the Phoenix currency, (which the Economist forecast in 1988 would rise in 2018), be a Crypto$. Or will it be gold backed trading in Yuan and Ruble. Or will it be the Bitcoin mania going to $1million? We don’t know of course. But what we do know is that 2018 is likely to contain many surprises on the currency front with massive volatility not only in currencies but also in most other markets. What we also know is that although cryptos can go a lot higher before they collapse, they offer no protection for investors seeking wealth preservation. Very few of the holders of the current $588 billion in cryptos will be able to get out before these reach zero. Greed is one of the 7 deadly sins and it always punishes mania investors. Gold will continue to be the only currency to survive in history just as it has for almost 5,000 years. Physical gold and silver is the ultimate form of wealth preservation as well as insurance against the economic and financial calamities that the world will experience in coming years. Whether there will be a new world currency in 2018 or not is irrelevant since all fiat currencies always fail. Gold and silver are today as unloved and undervalued as they were in 2000. It is very likely that the precious metals cycle bottomed in December for the third year running. Importantly every bottom has been higher. At $1265 we are today $220 above the Dec 2015 and $130 above the Dec 2016 bottoms. A new currency would only be a temporary phenomenon whilst gold will continue to be the only constant money in history. The very strong up-move of gold and silver in 2018 will take the investment world by surprise. Investors must pay heed and not be left behind.